Hibiscus moscheutos also known as Rose mallow or Swamp Mallow is a cold-hardy perennial that grows in zones 4-9. The plant can grow up to 3-8 ft tall depending on cultivar and produces spectacular, dish plate sized, flowers 5-12″ wide that bloom in mid-summer until first frost. The large, showy flowers attract hummingbirds and butterflies. Grow it in rich moist, well-drained soil with a ph 6.5-7.5. It will tolerate occasional wet soil. Hibiscus moscheutos can grow in full sun to part shade but blooms better in full sun. Fertilize in spring with a 10-10-10 . Mulch the plant during the dry summer to maintain even moisture. They should not be allowed to wilt. To prolong blooming time, deadhead flowers and remove seed pods. When finished blooming allow the plant to dieback before cutting the stems 3″ above the ground or cut back in the spring. In cooler climates, Rose mallow will completely die back to the ground in winter, therefore mark the area where it was growing so that you know where to find it next season and mulch the area to protect the roots. It will return the following late spring but needs warm weather and long days to break dormancy. In cooler climates, it may not appear until June. It can be started from seed. Soak the seeds overnight before planting. Start seeds indoors in late winter/early spring. Hybrid seeds will not come true but will revert to original plant. They can also be propagated from soft-wood tip cuttings in the spring or hard-wood cutting in fall as well as root division. A new cultivar for this season is Cranberry Crush a deep red color. I wouldn’t give up just yet. Don’t know where you’re located but they may be slower to start depending on weather conditions. I have a large flower bed dominated by Mums and Asiatic Lilies that has been undisturbed for about 5 yrs (other than pulling weeds). Last week, while cutting down all of the spent lily stalks, I noticed a beautiful bloom peeking up from the row of mums. I picked it and brought it into the house to identify it. Turns out it is a Hibiscus moscheutos with big white petals edged in dark pink w/ a dark pink throat. I have no idea where it came from, but I would love to transplant it to its own area in the yard. I’m afraid the Mums will choke it out if I don’t move it. When is the best time of year to do this (Zone 5A – Northern edge of Illinois), and how much of a root ball do I need to safely do this? Right now it looks like there are 4 shoots coming out of the ground. Thanks for your help. That’s a nice surprise to find in your flower bed. It’s a little late to transplant it now. (late Oct.) but it can be done. If you do, make sure you protect it after the ground freezes by adding 2+ inches of mulch around the root ball. The best option is to mark the area and dig it up in late spring when it starts to pop up from the ground. I have a Rose Mallow Hibiscus lasiocarpos which was planted this year. It has grown to about 4′ tall and has many what looks like spidery things hanging from the plant ends. Not exactly a bud but looks like it could be. It has not flowered and we are in aug in zone 6, so I think it should have bloomed by now. It is on a berm in full sun. Should we deadhead these to force a bloom or just leave it alone and see what will happen? The “spidery things” may be flower buds that are starting to form. Flowering may have been delayed because it was planted this year, although they usually bloom mid summer (July) – Oct. I would not deadhead just wait and see what happens. I have a lady baltimore hibiscus that is in a clay pot and has been for a few years and sits on the corner of my patio that gets full sun. I am in Connecticut. I trim it back in late fall and gets bushier and taller every year with more and huger blooms. It now reaches a hight of around 6 ft. I also repot in into a slightly larger pot every spring. This is the only one I have in a pot. And all my other kopper king and lady baltimore hibiscus are planted. My question is should I just get rid of it being in the pot and plant in the ground? Every year it seems like it just gets bigger and bigger. I assume that the reason it is in a pot is for decorative purposes, otherwise you would not go to all that trouble of repotting. It sounds as if it is starting to outgrow its container. As far as planting it in the ground – It’s up to you. Your hibiscus will thrive very well in the ground. I have a Hibiscus moscheutos growing in a pot. What should I feed it…the H. moscheutos is in a pot kept outside. Feed your hibiscus with a balanced 10-10-10 that includes micronutirents every two weeks. Check package directions for use. I have recently purchased 2 hibiscus moscheutos, Lady Baltimore & Lord Baltimore. I planted them 2 weeks ago, & have watered daily. The Lord Baltimore seems to be fine, but the Lady Baltimore does not. The Lady Baltimore wilts drastically every day, until evening when it’s cooler. We water them every night & try to make sure that they don’t dry out, but even when the ground is wet, it still wilts & looks like it’s going to die. Can someone help me out with this, so that I don’t lose the plant? I’m new to gardening & I love these plants. The plants are still in transplant shock and are trying to readjust to the new growing conditions. I suggest that you water well early in the day instead of the evenning. In addition, you may be watering them too much. When you water give the plants a good soaking and then wait a few days before watering again so the that soil get’s a chance to dry out slightly. I planted a Hibiscus moscheutos last year. It wasn’t impressive but in the middle of tall buddleia and agastache, it was fine. It grew to 8 feet tall. I went out yesterday to do late winter pruning, expecting the mallow to have died back. After cutting the tallest stalk halfway, I found he stalks were still green. I am wondering if I should still cut them to the ground. The surrounding shrubs will grow to 6 feet, so the stalks won’t be too unattractive if I don’t. Yes, you can cut them back to the ground or shorten them. They will just be taller, if you don’t cut it back. It will sprout new stems from the ground in warm weather. In colder regions, the winter cold will kill off any stems. I recently received a Hibiscus moscheutos as an indoor potted plant. It has dropped all of it’s flowers and most of its leaves. I live in planting zone 5 and it is September. I’m wondering if I should plant it outside or try to winter it over in the house and plant outside next spring. Help! Eventhough it’s not the best time to plant it. I think it will have a better chance of overwintering if planted outside. Do it asap and mulch around the plant after a after a hard frost to protect the roots. I have a beautiful “Mallow Rose” Hibiscus. It is a healthy green, lots and lots of blooming flowers, and its in large clay pot on my deck, and second season to survive the snowy conditions of the Sierra Neveda. My only concern is this: Once the flowers open, it is as if the stem can not hold the flowers weight and it droops, bending the small thin stem that holds the flower,then the flowers dont bloom as long, nor can you really see them, since they are pointing downward. Any reason for this or any suggestion to correct this issue? One suggestion was to plant the hibiscus a little deeper in the soil. It makes them grow stockier. Another is when the hibiscus starts to grow and gets about 2 ft. tall, trim it back a bit so that it develops a thicker and fuller stem. Plant your Hibiscus moscheutos in the ground now so that it will establish a roots system before winter. It will die back in winter and return late spring or mid-June. The flowers only last 1-2 days on Hibiscus. I just purchased a Rose Mallow Hibiscus and would like to grow it in a pot because I live in Canada zone 3 and 4 and pretty much know that since it’s a tropical flower it should be brought inside over the fall and winter months. My questions are can it be grown in a pot and what do I need for soil etc… How big should the pot be, right now I have pots that are twice as big as the plant itself. Do I have to do anything special to the plant before bringing it indoors for the winter months? What type of hibiscus is it? Hibiscus moschetos? 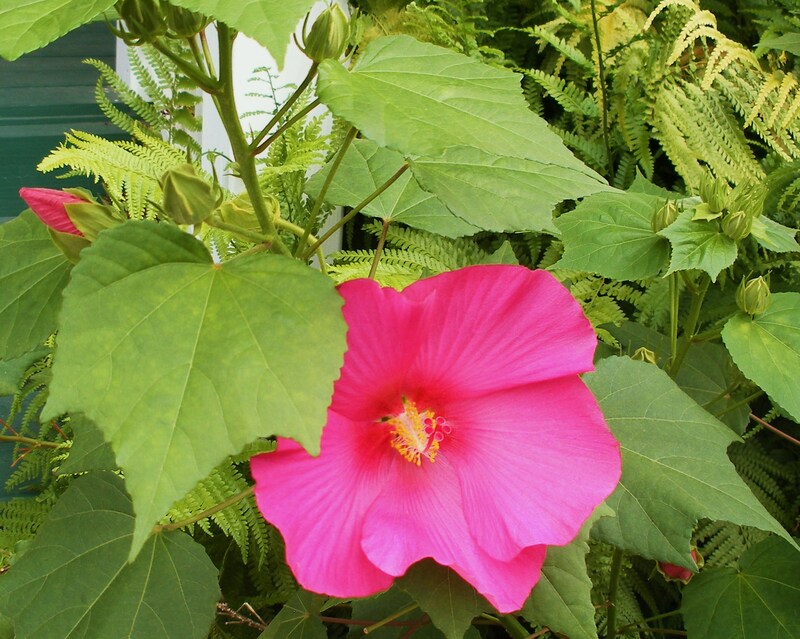 I have a Swamp Mallow Hibiscus that is in a pot and has bloomed beautifully for several weeks. The pot was a large pot, but slightly small for the 22 shoots that the plant put out this year, so after the main blooming was over we transplanted it to a larger pot, and now the plant has started drooping, one stem at a time. The leaves are wilting, but the stems are showing no sign of root-rot, are perfectly green and inside they have no discoloration. Is this stress from being re-potted? Would stress make it wilt one stem at a time? If so, what do I need to do for it to keep it from dying? I have moved it to the shade and am watering less, but don’t know what else to do. Any information would be appreciated, because I really hate it lose the plant. The plant is in transplant shock. Mid-summer is not the best time to transplant. The damaged roots have a lot of foliage to support and have a difficult time moving water up to them. You can help them along by cutting the plant back by 1/3 and try watering with a root stimulant. Don’t let the plant dry out too much, keep the soil moist not soggy. Hopefully, it will recover soon. I have a rose mallow hibiscus indoors. The plant looks perfectly healthy but the flowers have all fallen off before blooming. Whatâ€™s causing this and will they grow back this season? When buds drop before opening it usually indicates some kind of stress on the plant. Since it is growing well it may be just an environmental situation. Hibiscus moscheutos does better in a moist environment and the more sunlight the better. Try putting it outdoors, if you can or moving it to a brighter spot. They bloom through early fall so you should get some new buds. It sounds as if you have a Perennial â€“ Hibiscus mosheutos that produces dinner size flowers from June to fall. Some varieties can get up to 6 ft tall and produce woody stems which completely die back to the ground over the winter. They slowly return in the spring when the soil warms up. Division can take place in the spring when the new shoots are just emerging. They do not tolerate fall transplanting or root division. In warmer parts of the South, if the plant doesnâ€™t die back , cut it three to six inches to the ground. New shoots will grow in mid spring. source: Clemson Ext. Help! I just recently moved to MS zone 8. Bought two beautiful Hibiscus late last summer and planted outside. Didnâ€™t ask if they were hardy (silly me, I moved from FL) and it appears they are not as they are now black and wilted after a recent frost. One of the locals said to just cut it back even with the ground and next Spring all will be well! Is this possible?? They are well mulched and seemed to love their location responding beautifully after the transplant from pot to ground. Yes, there are varieties of hibiscus (H. mutabilis) (H. moscheutos) that die back to the ground and return in the spring. Keep the roots well mulched in the winter. Is it advantageous to the Hibiscus moscheutos plant to leave the seed pod attatched over the winter? Do the â€˜droppedâ€™ seeds produce new hibiscus starts? The seed pod can be left on the plant. It will scatter the seed and with a little luck produce new plants in the spring. You can also collect the pod and plant the seeds in the spring. The seeds will need to be soaked overnight before planting. I’m not sure what kind of hibiscus you have. If it is the tropical one, then there is a good chance that it’s dead. You might have a hardy variety that is just slow to get growing. Hibiscus moscheutos (hardy hibsicus), this shrub dies back to the ground every winter and emerges in late spring.